Liftoff! An Atlas V rocket carrying the IIF-12 GPS satellite took off from Cape Canaveral Air Force Station at 8:38 a.m. EST (1338 GMT) on Feb. 5, 2016. The final addition to a group of global positioning satellites successfully launched into orbit this morning. 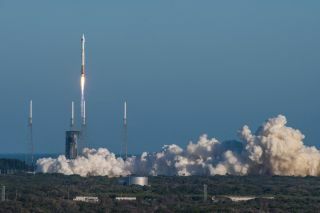 The GPS IIF-12 satellite took off today (Feb. 5) aboard an Atlas V 401 rocket from Complex 41 at Cape Canaveral Air Force Station in Florida at 8:38 a.m. EST (1338 GMT). The satellite was built by Boeing, and is operated by the U.S. Air Force. It is the 12th and final block IIF global positioning system satellite to launch. The Atlas V rocket is built by United Launch Alliance (ULA), a joint venture between Boeing and Lockheed Martin. As with previous IIF satellite launches, the rocket was in a 401 configuration, which consists of a 4.2-meter (13.7 feet) payload fairing and two booster stages. The Atlas V rocket carrying the IIF-12 GPS satellite had a successful launch on Feb. 5, 2016. GPS satellites fly at an altitude of about 12,550 miles (20,200 km), and provide global positioning, navigation and timing services to both civilians and military personnel. The IIF-12 launch date was initially delayed when ULA officials were alerted to a possible problem with electrical connectors in the Atlas V booster. In a media briefing Jan. 29, Walter Lauderdale, the GPS IIF-12 mission director, said the problem was fully investigated and solved, but delayed the launch by "a couple of days." "We took the time to inspect all the subject connectors and verified the integrity of those connectors," Lauderdale said. "Frankly, a day or two delay cannot possibly compare to the loss of a vital national asset. That is the nature of a sharp focus on mission success." Built by Boeing, the $131 million satellite will join a constellation of 30 other operational GPS satellites, the first of which was launched in 1990. The "Block II" family of satellites have consisted of the IIA series, followed by the IIR series, and the IIF series. The first IIF satellite was launched in 2010, and the GPS-11 satellite was launched on Oct. 31, 2015. The IIF-12 satellite is the last in the IIF series, and Boeing is already working on an IIIF series of satellites to join the GPS constellation. During a live broadcast of the launch, Dan Hart, vice president of government satellite systems for Boeing, spoke about the improvements of the IIF series from previous series used in this GPS constellation. According to Hart, the IIF satellites have improved clocks; a jam-resistant military signal; and a new, dedicated civilian signal that is particularly useful for commercial aviation and search-and-rescue operations.